One evening over dinner, Julie, my oldest son’s girlfriend (now wife) had me enthralled as she talked about a running blog she followed. Intrigued, I asked questions and knew immediately that I wanted to start a blog of my own. I had recapped a few of my races on Facebook notes and thought how fun it would be to have my own space just for talking about all things running and fitness. 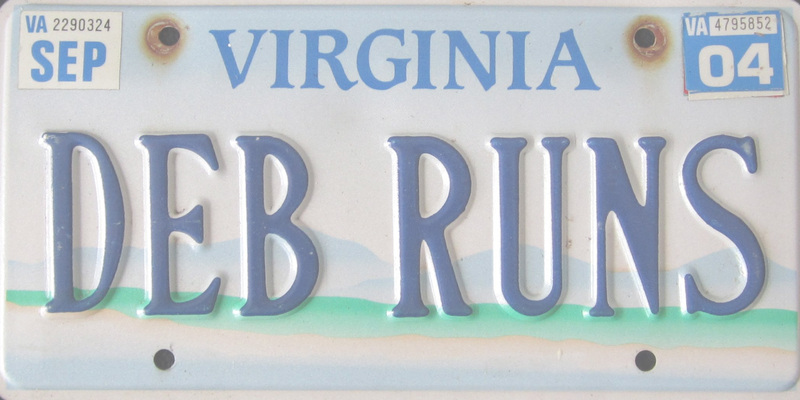 It took me about two seconds to come up with Deb Runs as my blog name, the name that had once been on the vanity plates on my car. I used a picture of those expired plates for the banner on my blog until a year or so later when Bill stitched together the pictures that I’m currently using. 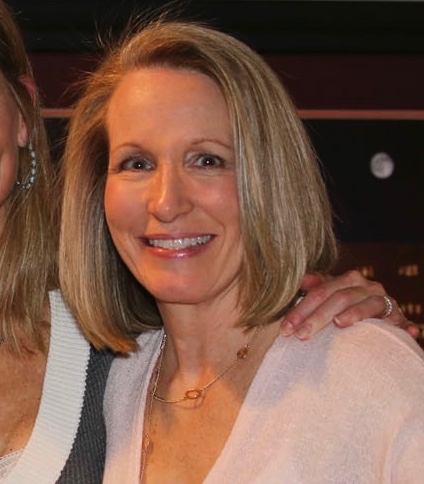 With a little help from my husband and son, Deb Runs became a reality, and about two weeks later, I published my first post, a painful and rather sad request to “stay tuned.” As I diligently wrote posts, I added tabs to organize my topics. Articles on how to improve running and racing were placed under my Coaching tab, healthy recipes and tips for weight loss were placed under my Weight Management tab, and posts hoping to help my readers learn from my sun-worshiping mistakes were placed under my Skin Cancer tab. Other tabs were added over time and can also be found near the top of page, just under the blog banner. My most popular post to date was What It’s Really Like to be a Hokie which got 1,784 views and had nothing to do with running! The post that gets several hits every single day is My Favorite Walked Into A Bar Jokes Are Corny, Hilarious, And Even Educational. It’s an evolving post where I occasionally add jokes as I come up with new ones or a friend sends a new one my way. Through blogging I’ve made many new friends, both in real life and virtually. I met some of those virtual friends in real life at planned meetups at races or training runs, and I’ve even randomly met people at races who recognize me from the blog. Believe it or not, Deb Runs holds me accountable. On days I’d rather skip a workout, remembering that someone might be inspired by me choosing a workout over sleeping in, I’m a whole lot more likely to make that workout happen. Blogging has also given me an opportunity to bounce ideas off of other like-minded people when training difficulties or injuries arise. To celebrate my six years of blogging, Kudos was kind enough to offer two of their amazing coasters as a prize that one of my readers can win! A few weeks ago, I wrote about the many uses and things that can be displayed in these unique coasters. If you would like a chance to win two Kudos coasters, please enter below! Winners will be selected by Rafflecopter at midnight on Wednesday, February 6, and announced in my Weekly Round-Up on Sunday, February 10. Once the winner is announced, that person will have until Wednesday, February 13 to claim the prize. I will make every effort to contact the winner; however, if the winner fails to claim their prize by February 13th, another winner will be chosen. Relatives of Deb Runs and Kudos are not eligible to win. If you win, what will you place in your coasters? If you blog, how many years have you been blogging? Happy Happy Blog anniversary! It’s been so fun to get to know you the past few years on line and in person. Thanks, Deborah! Same with you! How exciting happy blogiversary! I’m not sure exactly what I’d put in the coasters yet but I’ve got lots of choices haha. I need to keep up with your blog better! I didn’t realize that you are a relatively newbie runner. You certainly came out of the starting chute strong! Good luck! Yes, finishing a marathon is a very proud achievement! Good luck! 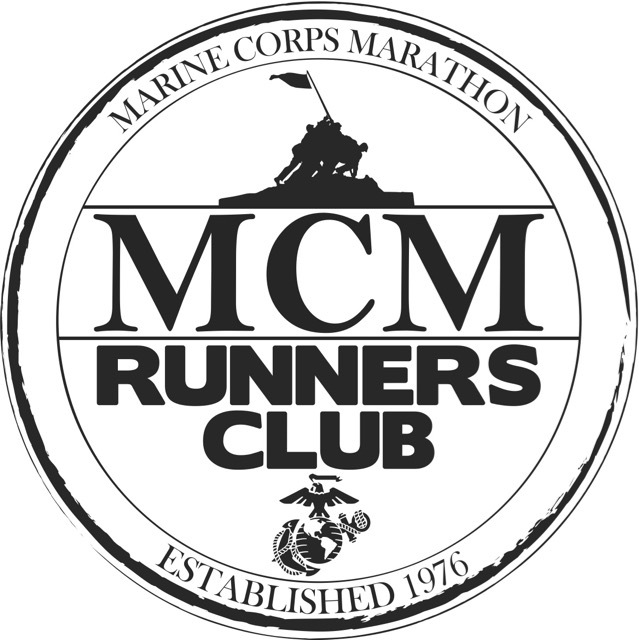 I would give one to my daughter for PR ing in last months Houston marathon and keep one for finishing the Cape Cod half in Oct during a Nor’easter. Congrats to you both; and I’m giving you a high five for finishing the Cape Cod Half during a Nor’easter! Good luck! hmm… not sure, but Happy Blogiversary! 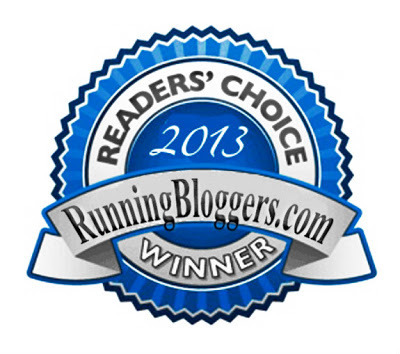 Congrats on the Blogiversary and all the races! That’s an impressive total. I needed my son to help me set up my blog too. I am hopeless at techie things. so glad I got to “meet” you through our blogs. Making online friends has been the best aspect of blogging for me! Isn’t it the best? Still hoping for us to have a real life meetup at a race someday! What a great look back at your blog by the numbers. I thought I entered since we had the “how long” conversation, but it must have been another, similar post. I think I’d frame Lebow, since it’s closest to my heart. 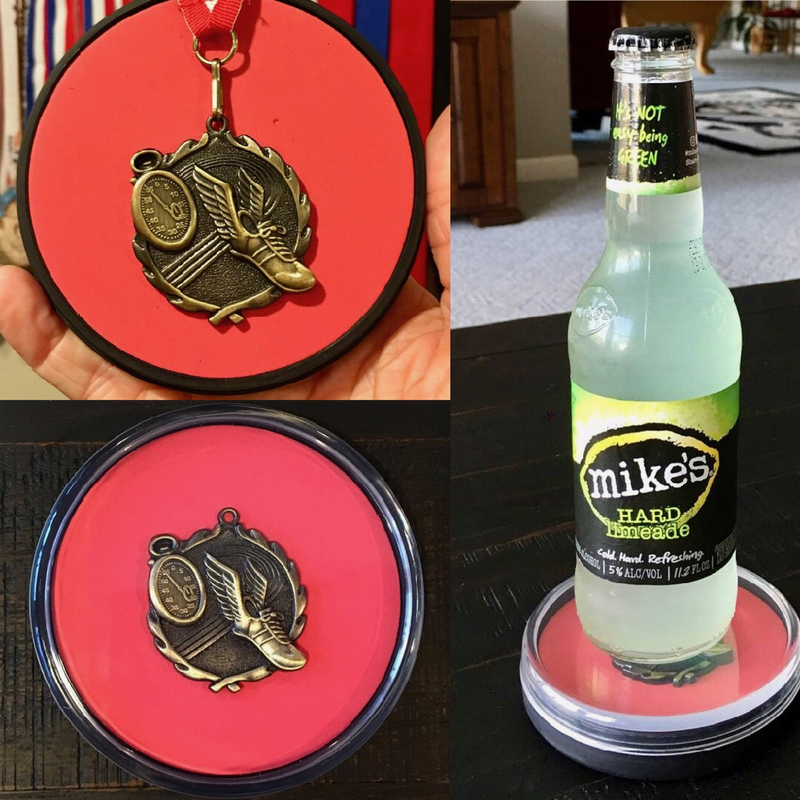 Your Lebow medal would be a great one to put in the coaster and show off. Good luck! Well, I’ve ot a lot of medals to choose from ! I would probably just rotate medals in and out, putting in my most recent. Oh, I like that idea to rotate your medals with your most recent getting the spotlight. Good luck! Sounds like it – congrats! I LOVE Kudos! First saw these at a Chicago Marathon event last fall.. was SO bummed to win a TShirt at the event vs one of these coasters! I JUST started running 3yrs ago, so… I’m super impressed by your story! Wow the races you’ve accomplished- amazing! Congratulations!!! I would display a medal that I won.